Seeing the demand for schools in the new estates, The Ngee Ann Kongsi established Ngee Ann Secondary School in Tampines in 1994. Over the years, the school had excelled and maintained outstanding performance in its academic and co-curricular spheres. It was accorded Autonomous School status from 2004. Although The Ngee Ann Kongsi does not manage the functions of the school, it provides Ngee Ann Secondary School with up-to-date facilities and technologies to meet the demands of the 21st century. 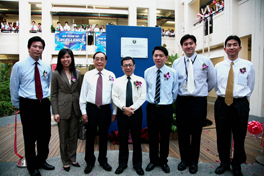 To date, Ngee Ann Secondary School is still among the top percentile of schools in Singapore.